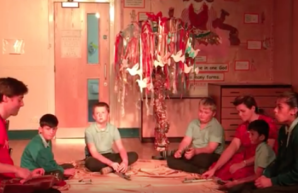 Ben McCabe from More Music has been working at Royal Cross School in Preston this term and they made some great videos of music created with the children. The project is part of More Music’s SEND schools delivery which is subsidised by Lancashire Music Hub. I asked Ben to talk a bit more about what he’s been doing at the school to explain the background to the videos, which you can read below. Royal Cross School is a fantastic school for deaf children from across Lancashire. Mrs Sumsion, Mrs Dewhurst and I have worked together with Willow Class to make a suite of songs that explore different ways of incorporating sign language into songwriting. The class have been looking at Victorians as a theme and in ‘We Work Hard’ Mrs Sumsion encouraged the children to explore themes around children’s experiences in the past compared to now through drama activities in pairs. One person was a child from our time visiting the other in Victorian times (including costumes and make up!) The children chatted, compared daily routines, toys and gadgets and then re-enacted for the rest of the group to see. We managed to capture thoughts, feelings, ideas and signs from each pair to make a verse each for the song. You can see the discussions in the intro to the song – the melody here came from an improvised folk tune that came out of listening to Lavender’s Blue. For the main body of the song the children chose chords for me to play on the guitar and we decided on the pace and feel that would suit the song. ‘This is the Sound’ came from an improvisation and turn-taking on an Appalachian dulcimer. We talked about the sound and mood of the instrument and came up with a few simple phrases: This is the sound, relaxing sound. Meditating. Amazing, I like it. We then worked up an arrangement using humming, singing, signing and chimes that we performed for the rest of the school at Diwali. We’ve worked on finding lots of new ways to start songs, remember songs and perform them. It’s been an education working alongside Mrs Sumsion and Mrs Dewhurst. Mrs Sumsion pointed out that sign language is very efficient and this fundamentally affects what you can do in writing a song. You don’t need to say the long and winding road if you can just sign a long and winding road! Starting writing from drama is brand new for me. I wouldn’t have had the confidence to set children off on a drama task (no matter how simple) but will definitely be trying this again as organic and individual things pop up that wouldn’t do in question and answer sessions. More Music has funding from Lancashire Music Hub to subsidise the cost of sessions in SEND schools by 50%. For more information, please contact darren.leadsom@moremusic.org.uk.